When we meet up with mystic for the first time, it is human nature to be anxious. Such was the framed mind of the entire ship’s company when they came to know of the impending storm. Tarangini had left Le Havre after a 02 week maintenance period and was aware of the interesting times in store for her in the Bay of Biscay. Camaraderie among the sea farers across the world was at its best as every vessel or coast guard station passing us kept briefing us on the weather ahead and the warning us of the reputation of Bay of Biscay. These continuous ticks gave the Command Team all the right reasons and inputs to dive into the details. Soon the weather reports from various sources were collated and a not so happy picture emerged. Time and again, the requirement for brave words and actions began. The cap with the brass rose to the lead and gave the heads of the ship a detailed briefing, where the priorities were sorted out and the tactics required for the crew to survive the unexpected outlined. Safety topped the list which included every single soul to all the seasoned and darkened wood. Requirement was to maximize on the available resources and man power over a period of four days. Hence all the duties and routines were revamped and a new storm organization was set into place. It was remarkable to see how the ship’s company could so easily transform and make it available to the new organisation. Incidentally, we, ‘The Third Batch of 88 IOTC’, were only a couple of days old on the ship. The words from the old man, “What better way to earn ones sea legs than face an Atlantic Storm?”, thus had an ulterior meaning to them. On this ship the Trainees form an important part of the sail organization and they play a very significant role in the day to day operation of the ship. We were thus ‘The Lucky Ones’ of our course to experience life at sea first hand, the cool side and the cruel side. Strict restrictions were put into place and the crew was put through detailed and regular briefing about the Do’s and Don’ts of every situation with every person nominated along with his buddy for specific tasks. Every person was expected to be tethered to his buddy and all activities (Barring some of the personal nature) were to be conducted in pairs. 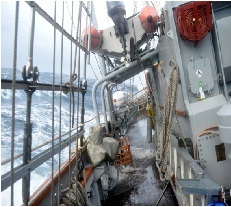 With the ships belly full and all tanks ballasted, the rig storm stowed, equipment on upper decks tied with additional ropes and crew braced, we began the hunt for this Atlantic Storm. It all began at daybreak of 13 Sep 15 with two breathtaking rainbowsdiametrically opposite to each other. As predicted, the angels turned on their dark face at a short notice. A sharp decent in the pressure from 1107 to 970 mm of Hg, within a period of 4 hours, depicted the commencement of hostilities. The next four days were to be the most trying days of this voyage. Options of alternate ports in case of an emergency were too far to be considered. The next three and a half days would bring wind speeds of 50 knots gusting to more than 70 knots, wave height in excess of 7 meters, frequent rain and thunder shower, minimal visibility at night and in rain and not to mention traffic, where 400 meter long ships were found struggling to make a decent headway. Fog and wind chill due to the Atlantic cold front only added to our troubles. The ship had to be steered from wave to wave to reduce role and pitch and obviate broaching or pooping. This became close to impossible at nights as the lack of visibility ensured that we only saw a wave after it had hit and drenched us. Inspite of both the engines and storm sails trying their best to keep her going from wave to wave, we were being set backwards. Any alteration from this course would role the ship and the chances of a capsize seemed quite probable. The team thus stuck to the plan and kept the sea and wind on the bows. The plan was to weather the storm. Sustainability over a period of almost four days both in terms of crew and machinery fatigue had to be borne in mind. Sleeping arrangements had to be altered as the bunks couldn’t hold us in place. We thus resorted to sleeping on the deck in our messes, stacked against each other. The ones who couldn’t sleep were forced to go down and rest so that they could be alert during their watch. Crew fatigue and absent mindedness could lead to mistakes and injuries, thus rest and food was mandatory. One must acknowledge the efforts of the Galley staff who worked tirelessly to feed the few who were willing to eat. By the end of second day, ship had travelled about 80 miles on a course of 150, while trying to steer 240 - 280. The watch keepers had started showing signs of fatigue and the Doctor was busy attending to bruises, cuts, lacerations and cases of extreme sea sickness. 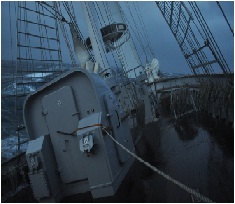 The watch organization was again tweaked to ensure optimum availability of personnel on deck and Engine Room, as the ship prepared for the worst day of the storm. 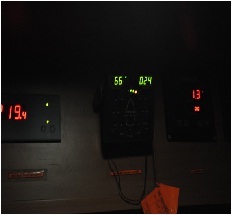 Predictions indicated wind speeds in excess of 65 knots and a wave height of 7-8 meters. The night of 16/17 Sep was by far the roughest. Today as I write about the days at Bay of Biscay, these famous words pasted in the Sea Trainees mess make lots of sense,” Rather than having an army of lions lead by sheep, I would like to have an army of sheep lead by lions”. – Napoleon. Here we are required to lead a pride of lions called the Indian Navy. We better be knowledgeable, courageous and compassionate all at the same time, for these are the man capable of achieving the impossible. It had been 3 days and the crew had steered her with precision correcting the course every time she turned her head, veering with the wind on her bows. Everyone on board was well aware that the struggle shall last only half a day if we escape the storm, but the consequences otherwise was deadly. Entire day the courage of the crew stayed warm even as the rain and wind chill made the most hardened shiver. The sea state was eight and anyone could imagine its lethality. Every now and then the roll of the ship dipped the gunwale, as the bowspirit plowed through wave after wave. 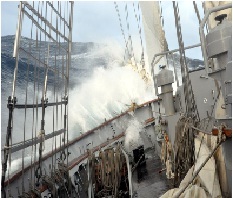 The waves had been well above the ship for the last three days. It had been like a theme park ride on a rainy day. There had been no sunrise or sunsets. Slowly as the dusk faded, the sea began showing a ray of hope, as the wind speeds reduced. The crew had to wait for another day for the swell to reduce. There was no time for laurels as the damages had to be repaired and the ship prepared for her next stop at Lisbon, Portugal.